Started when BSA introduced their oil-in-frame models, Norton had an 850 in their range and when you could still buy a Matchless twin and a Velocette Thruxton..... Autocycle opened in Moxley, West Midlands in 1971 and is now based, not far away, in Dudley near Junction 2, M5. Browse through our catalogue of British Motorcycle parts, and contact us for more details. Check out our new eBay shop! Always only supplying to the British motorcycle market, as the home-market collapsed we were in a position to buy large stocks of spares as the major companies declined. We still have stocks tucked away from this period and occasionally release parts once more to the open market. As local dealers folded, one by one we bought their British bike stock. Nowadays we only sell new parts, in 2003 we cleared all the second-hand stock selling 1,600 tea chests of spares. Never wavering from our British-only ideals, today we manufacture a wide range of components going back into the 1920's and sell worldwide to virtually every continent. 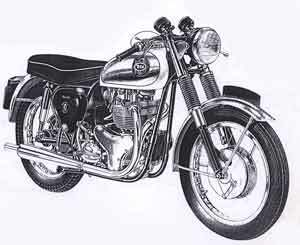 The core business of our set-up, selling spares for all makes of British motorcycles and offering certain workshop facilities. We undertake some work in the restoration field eg. chrome-plating, powder coating, but no longer service motorcycles. The manufacturing and fabrication side of the business includes small batch production of spindles, valve guides, bushes, springs etc. right up to carburetters, cylinder heads and crankshafts. Our modern CNC machining facilities and comprehensive grinding capabilities enable us to take on most challenges. Not only a manufacturer, we also buy in a range of goods, preferably of UK manufacture, to cover not only the popular but also less common models. Being at the hub of the British bike scene, we have made many contacts in the trade and can often source parts we don't actually stock. Our company managed to purchase, from several sources, most of the existing original Birmingham stocks of spares. This range includes: Monobloc, TT, 1000 Series, GP, Mark I and II Concentrics, Pre-mono Standards ie 276/289 etc as well as the lesser-known: 363, 261, 361, 223, 523, 332, 32 and 27 ranges. Even nowadays, we still have stocks of genuine parts though most spares supplied are recently manufactured from drawings. 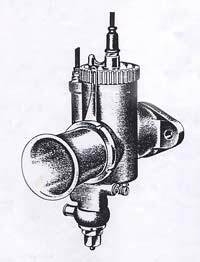 We occasionally make small batches of carburetters complete as well as float-bowls and accessories. From our stores we can offer spares and components never originally listed with improved function and design, like needle conversions for Speedway T27's, brass slides to replace die cast, etc. Our workshops are equipped to overhaul most carbs and special items like under/oversize top rings and slides are not only fitted but supplied direct. We started buying carbs and spares in 1971 and have accumulated a small stock, that may help if new parts cannot be supplied. We've raced bikes from Broughs to Vincents winning several championships along the way, so we have some practical experience in carburetter settings. Our engineers are well-versed in the technicalities of carburetter problems and can often offer advice on specification and technical queries. Needless to say, our time is precious and we would ask that the questions are brief and to the point. Establised in 1907, the oldest motorcycle repair company in the world, still repairing frames and forks after 100 years! We have some original frame/fork jigs that these bikes were made on in the first place. Although we tend to specialise in rigid and girder fork models, we can still repair T160's and the like. Percival Bros are the most experienced frame repairers on earth and as the word has got round we don't go looking for work as it seems to find us, however, as some jobs can take weeks on their own - be prepared to wait. 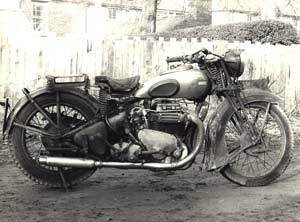 Eddie Dow started BGSS in 1958 and within a decade was able to boast to having the 'largest BSA stock in the world'. 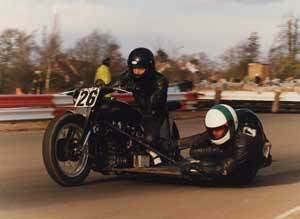 When Eddie moved on, Ken Gardner took over and in due course we had our turn in 1988. Forty years on from Eddie's inception we can still claim the largest stock of Gold Star spares in the world. This BSA stock spills over into other models - obviously the B31/3 and A10/RGS ranges and, by buying redundant dealers' stocks, the range covered spans from DI Bantam to A75 Rocket 3. With the Autocycle Engineering parent company, we don't just buy and sell spares but actually manufacture them in our own factories and rarely source items from abroad. If it's a new crankcase or the little nut that holds the Metalastic on - we can help. Our stocks still include original Armoury Road spares as well as some of Eddie's stocks from the 60's. 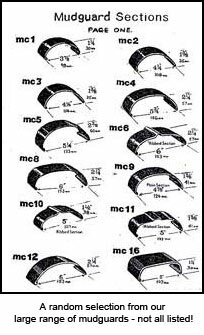 Autocycle Engineering bought out the name, rights and manufacturing capabilities of Speedwell Mudguards in 1989 including some original pre-war tooling. Speedwell made guards, rear number plates, chainguards etc. for a huge range of manufacturers with a workforce of 130 in guards alone. Sadly a lot of the tools were scrapped in 1977 including the deep-valance presswork for Gold Flash, Norton SS and Super Rocket. Today, with a considerably reduced workforce, we still make batches of guards for dealers and keep a reasonable stock ourselves. We sometimes offer 'one-offs' but these will obviously have to wait until machinery is set up for the larger order and 'tag on' behind. In stock we keep a universal range with 30-odd different sections and a myriad of lengths and radii. The length of a guard is not critical on a universal but the radius is. Measured from the spindle centre to the centre line of the guard, this radius controls the fit and the look on the bike, production guards vary by 1/8" increments. 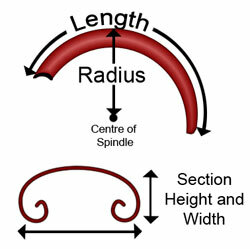 Should you ring and enquire about a one-off guard, we will ask for: section, radius and length (see diagram) - so please have an answer ready! Available in mild-steel, chrome, alloy and stainless, they're all made here in the Black Country on the original machines.